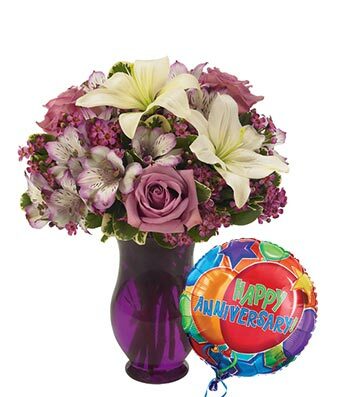 Say 'Happy Anniversary' with a unique purple flower bouquet. Artfully arranged by a local florist with fresh purple roses, white lilies and purple alstroemeria. Delivered by hand in a keepsake purple vase, this gift will wow your loved one. Available for delivery today or next day, when needed. Measures 13"H by 11"L.